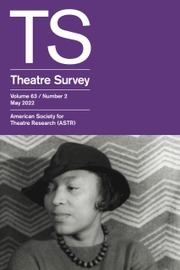 Theatre Survey is chartered by the American Society for Theatre Research as a theatre history journal. Its theatrical and historical orientations are broadly conceived. Performance-centered and historiographic studies from all points across the historical, cultural, and methodological spectra are welcome. Recent issues have included an article on the early professional deaf theatre in post-Stalinist Soviet Union, a study of the gestural vocabulary found in surviving images of early commedia dell'arte, a philosophical treatise by Alan Badiou, and an essay on the impact of neoliberalism—from the classroom to the department to the “global university”—that suggests how theatre and performance scholars might approach the political difficulties currently threatening the mission of higher education.